Marchion Williams, who appeared in Allen County Common Pleas Court on Monday for a sentencing hearing, instead asked the court for permission to fire her court-appointed attorney, Bill Kluge (pictured) and to withdraw her earlier plea of guilty to a charge of murder. Williams was scheduled to be sentenced to 15 years to life in prison for the murder earlier this year of Lima resident Eddie McClellan. Marchion Williams, 40, listed in court documents as “homeless,” appeared in Allen County Common Pleas Court for sentencing after pleading guilty Sept. 5 to murder in the death of 40-year-old Eddie McClellan earlier this year. Ohio law called for Williams to be sentenced to a mandatory prison term of 15 years to life. Several weeks ago, however, Williams sent a letter to Judge Jeffrey Reed stating that she was dissatisfied with the legal representation she received throughout her case from court-appointed public defender Bill Kluge. The attorney said he received a similar letter. Reed asked Williams if there was anything she believed the court needed to know. She replied, “No, he (Kluge) said everything.” Upon further questioning from Reed, Williams repeated her desire to fire Kluge and have another public defender appointed to her case. Reed agreed to that request and said another sentencing hearing would be held after the new attorney had the opportunity to familiarize him or herself with the case. The judge did not say whether a motion to withdraw the previously-tendered guilty plea would be considered. The charges against Williams stem from an incident that took place late on the evening of March 13 or early on March 14 at McClellan’s residence at 605 Fairview Ave., Lima. Police were dispatched to the home in reference to a stabbing incident. Upon their arrival, officers found McClellan, 65, suffering from multiple stab wounds, including one in the chest, according to court documents. He was transported to Lima Memorial Health System, where he was pronounced dead a short time later. Police say McClellan had allowed Williams to stay at his home for a few days because she was homeless. But when he asked her to leave the home, the pair reportedly began to fight. Williams admitted to police she grabbed a knife and stabbed McClellan out of anger after he ordered her to leave, according to court documents. As part of a negotiated resolution, Williams pleaded guilty last month to an unclassified felony charge of murder in exchange for the state’s dismissal of a second murder charge, along with two counts of aggravated robbery and one count of felonious assault. 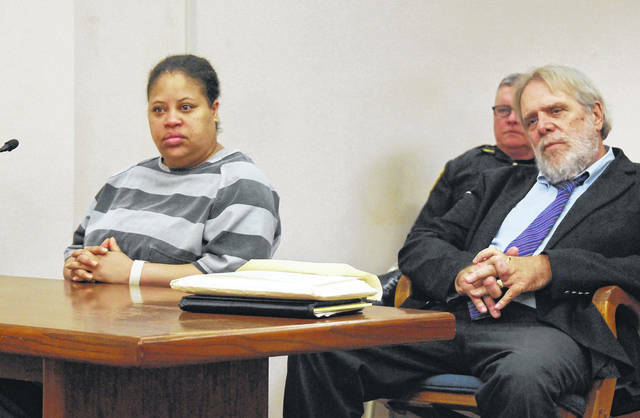 https://www.limaohio.com/wp-content/uploads/sites/54/2018/10/web1_Williams-and-Kluge.jpgMarchion Williams, who appeared in Allen County Common Pleas Court on Monday for a sentencing hearing, instead asked the court for permission to fire her court-appointed attorney, Bill Kluge (pictured) and to withdraw her earlier plea of guilty to a charge of murder. Williams was scheduled to be sentenced to 15 years to life in prison for the murder earlier this year of Lima resident Eddie McClellan.